This is taken as a very complicated tarot card by many readers, for it conveys many messages. It is claimed that she usually is filled with the acute knowledge about the world. At the same time, she is portrayed as the pure woman of spirituality. In love and relationships, this is what we need to translate for a clearer picture of the situation. I have drawn this card for women who are controlling by nature in their relationships. As a matter of fact, they know exactly what to do to gain their partners’ attention, but in a good way. But for men, it is that one specific woman who greatly influences their hearts and souls in a positive way and they can never deny that. In short, to male species, upright, she is an attractive person, but not because of her beauty. Recall the fact that spirituality and purity is attached to this tarot card. What this means is that the men drawn by this woman’s personality and not by her sexuality. Yet what is unfortunate in this situation is that this woman does not really want to date any of these men. For questions regarding relationships, the High Priestess emphasizes intuition. Yes, listen to your intuition when things in the relationship are not what they seem like. You can just say that this card is implying the “you knew it” effect. 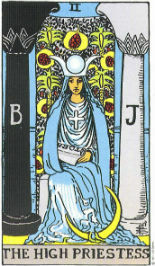 In reversed position, the High Priestess is linked to a woman who goes through many one night stands. Thus, men tend to think of this woman as someone who tries to use her sexuality to gain their attention. Unfortunately, because of this, these men will not approach her for serious relationships. For relationship questions, this tarot card emphasizes the fact that your higher self is not responding to you. That is why, you are searching for answers regarding your relationships from third parties. Ten of Cups: Free love. Google Plus is Dead. You Can Still Stay in Touch with the Author on Twitter. © Copyright 2019 Priania. Designed by theme9 | Distributed By Gooyaabi.